Did you know that RoHa Brewing Project, Fisher Brewing Co., RPM Brewing and Kiitos Brewing Co. all opened their doors in 2017? That's already an impressive year for Utah. But believe it or not, there's one more popping up—2017's fifth and final up-and-coming operation: SaltFire Brewing Co. (2199 S. West Temple, 801-661-1947). SaltFire came onto the brewing scene a little backward in that they started with a bottle-filling device. Normally this is one of the last purchases a brewery makes, but this bottle filler was created by SaltFire's owner and grand poobah in charge of beer, Ryan Miller. He's sold hundreds of his innovative and inexpensive devices around the world, and it paid in full for SaltFire's entire brewery. Now SaltFire is nearly ready to fire up its shiny new bought-and-paid-for brew house. Of course we wanted to be one of the first to get the scoop on what we can expect. 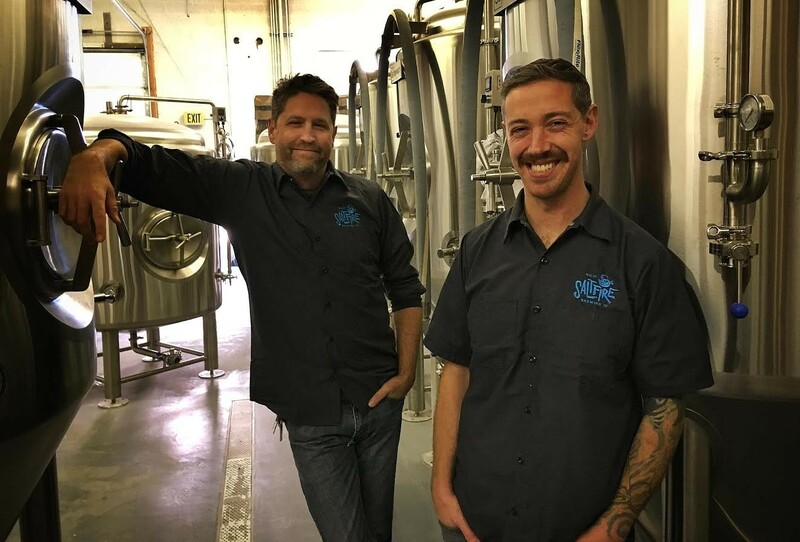 SaltFire's head brewer, Patrick Bourque, has earned his stripes in Utah's beer community with positions at The Beer Nut, Epic and Uinta Brewing. "Our first four beers are going to be a mix of approachable strong ales," Bourque says. "Of course we'll have an IPA. It will be part of a rotating single hop series, along with a Double IPA to help us flex a little muscle." Everyone has an IPA, but SaltFire plans to move beyond. "Yeah, we've got that covered," Bourque adds. "In addition to those, we will also be brewing up a dirty chai stout, brewed with local Blue Copper coffee and Indian chai spices." Now that's potentially a recipe for some tasty, outside-of-the-box beers. But there's even more coming. "On the other side of the spectrum, we will also be offering a New Zealand Pilsner," Bourque says. I wasn't exactly sure where he was headed with this one, but Bourque explains, "It'll be a different take on the classic Pilsner. We're going to take advantage of the those newer, fruity Southern Hemisphere hop varieties and pair them with that classic German Pilsner base. It'll be damn tasty." Though high-point beers will be SaltFire's focus, Bourque understands that they can't afford to stay completely out of the low-point beer game—this is still Utah. "To start with, we're going to brew mostly high-point beers, with some 4 percent stuff mixed in eventually," he says. "We do want a tap room eventually, so low-point beer will definitely be on our horizon. "However, when we make a low-point beer," Bourque continues, "it's because it's something that we love and not because we want to have just any beer in a grocery store. That's important to us." Bourque also says that SaltFire's taproom will open within the next year, and that it will include a bottle shop opening as soon as beer is ready in January. Recently, SaltFire's home municipality of South Salt Lake City lifted its "two breweries maximum" ordinance, which will allow more breweries to open in their neighborhood. "I'd love to see more breweries set up near us," Bourque says. "We love having Shades of Pale Brewing a block away, and we look forward to having more like-minded people in our area." What about added competition? "I don't see them as competition," Bourque says. "I see them as great friendships and contributors of knowledge that will hopefully benefit brewers and beer lovers alike." Stay close for updates on SaltFire Brewing Co.'s debut beers, and my impressions of their new suds. As always, cheers!